Just days before the phone will see the light of day on September 6th, another render of the LG V20 has surfaced. The image 'confirms' that the new model will feature a dual camera setup on the back of the handset, with a single front-facing camera for selfies and video chats. The LG V10 featured two cameras in front with a single snapper on back. There is a lot about the LG V20 that doesn't appear on a render. First and foremost, this is a multimedia device and it contains premium sound capabilities thanks to a partnership between LG and B&O Play. The latter is a unit of Bang & Olufsen. The earphone that comes out of the box will be a B&O branded model, and the phone will be the first ever to carry a 32-bit Quad DAC chip. The component is made by ESS Technology, and produces 50% less ambient sound. It converts digital files into analog so that the sound can be heard by the human ear. The LG V20 will be the first handset to come out of the box with Android 7.0 pre-installed. According to rumored specs, it will be equipped with a 5.5-inch screen offering a 1440 x 2560 resolution. There is a 2.1-inch secondary screen that is always on. A Snapdragon 820 chipset is under the hood with a quad-core 2.15GHz CPU, and the Adreno 530 GPU. 4GB of RAM is inside along with 64GB of expandable internal storage. A 256GB capacity microSD slot is available to those seeking additional memory. Keeping the lights on will be a 4000mAh battery. A fingerprint scanner can be found under the cameras on back. After next Tuesday's unveiling, we should be able to pass along all of the information you're seeking about the LG V20. We do expect to see some more leaks over the weekend, so feel free to stop by often. Looks pretty slick to me. I disagree I have the LG V10 and I like the design, but let's be real last year a lot of people liked the design of the of the Samsung S6.Then when they unveil the Samsung S7 they got a lot of criticism because people said it is basically the same as the S6. 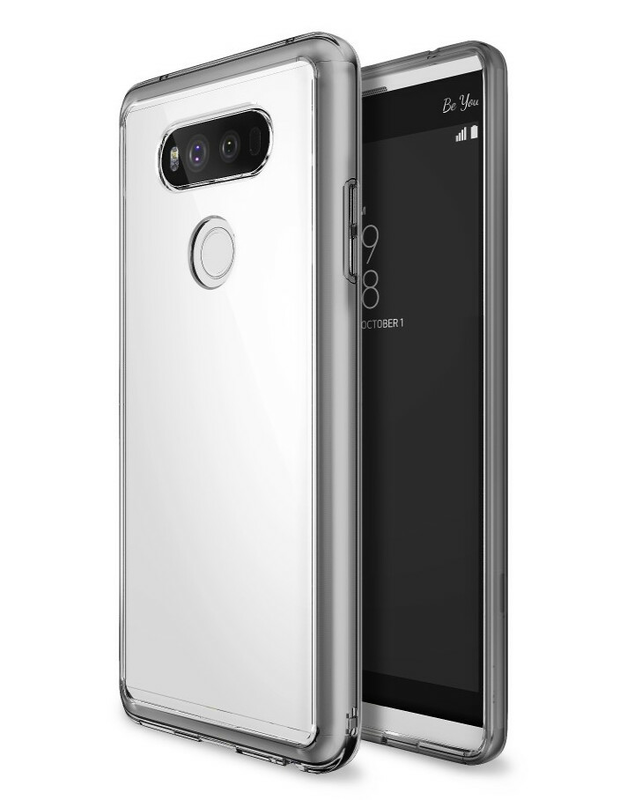 So why the heck should LG basically keep the same design as the V10, you can't have it both ways. You can't Bash one company for keeping the same design for a few years and then get mad when another phone company don't keep the same design doesn't make any sense. You mean the G5 renders? Why only 5.5 inch ;/? Why this horrible design, lg v10 look much better and much more interesting. Ugly but judging by LG track record it wont explode on their user face. The ball is your court now, LG. They set the bar too high on the V10. now they can't even reach it. Some of you people in the comments say anything. They set the bar high for the V10 and now they can't reach it. What are you talking about. This phone has a better dac than the V10 better camera better video recorder better speakers Better Sound Android n better battery life. And you say they can't reach the bar of the V10. I have the LG V10 but this LG v20 is a better phone then the LG V10 just like the G5 is a better phone than the G4 and I have the LG G4 also. There's reports that the v10 might not even get Android n I've seen a few list of cell phones from each company that's supposed to get Android in and I didn't see the V10 or neither of them. Let's just this doesn't turn into a grenade..
Not bad, better than G5 or S7, do not like the glass on the back, strains and is easily breakable. NO 5,5" but 5,7"
As a owner of the v10 I will be upgrading to the v20 my only concern is I hope they have a black colors variant I don't want no gold or silver or white color I get all my phone black so give me a black color option. Please stop with the lazy journalism! I cannot stand the use of the phrase "keeping the lights on". It has been done to death! Perhaps you could try something playful like "rather than using a thermonuclear reactor LG have opted for a more down to earth 4000 mAh battery". Maybe just factual "powered by a 4000 mAh battery". You could opt for a comparative approach to last years phone or to anything you deem a competitor. Maybe satire is a preferable option with "powered by LG's patented non-exploding 4000 mAh battery." ANYTHING BUT KEEPING THE LIGHTS ON. I am surprise the article did not start with "LG will be trying to capture the hearts and minds with the LG V20". "Keeping the lights on" is the only one you see? There's also "under the hood". Neeeed because it's LG phone! The design will be hidden in a case anyway. You keep saying 5.5. Other sites say 5.7. What's the truth? Have a bad feeling this won't sell to good. LG will have to go back to the drawing board. Same thing was said about the V10 and it sold pretty well. I sure hope the screen is not smaller. This phone has to be 5.7 inches like it's predecessor other wise I won't be getting it because if lg is smart they would keep same size! I see some Sammy fangirls here doing the usual hating. I really wish you girls would find something better to do than troll every LG post. Don't you have make up to put on or something? At least its only a few of you this time. Looking forward to the V20. I'll be adding it to my collection alongside my Nexus 4, G2, G4, V10 & G5. Why does everyone have to follow Apple with the stupid dual-camera setup? It's really really ugly setup and brings down the aesthetics of the phone as a whole. To follow Apple in this fashion, Apple would need a time machine - which as far as I know, only the U.S. (Black Ops Govt.) owns. FYI - LG and HTC pioneered the (primary) dual-camera phone back in 2011 with such abominations as the Optimus 3D & Evo 3D. After that, the concept was abandoned for some time until LG (again) released the G5 on April 8th and Huawei with the P9 on April 29th of this year. That's right! I forgot about the LG Optimus 3D and HTC Evo 3D. So in fact Apple was the one who copied others. But I still think the dual camera setup is rather ugly. This render just depicts the same G5-like design previously leaked, only this one shows the device inserted in a rather average looking protective case.